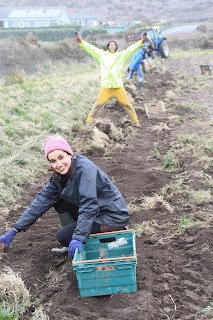 Lifting the final few lines of potatoes with five wwoof volunteers. 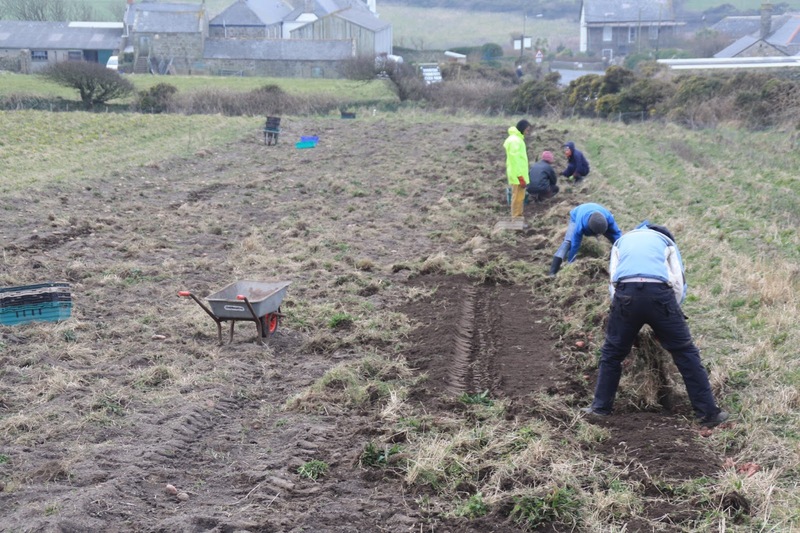 On Monday 14th March we lifted and brought in the final few lines of Sarpo Mira potatoes from Four Acres, which yielded about half a tonne, and was over by mid-afternoon. Rita, Cameron, Marie and Elliot. 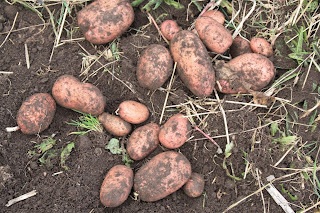 We now should have enough potatoes in storage to see us through the hungry gap until our new potatoes are ready for lifting, sometime in June. 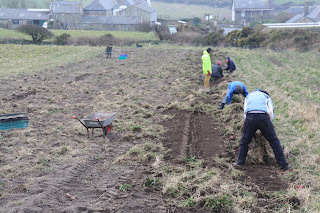 We started planting the first of this years potatoes this afternoon, getting all 15 sacks of Maris Peer into the ground (the first of five varieties this year, the others being Picasso, Cara, Ambo and Sarpo Mira). 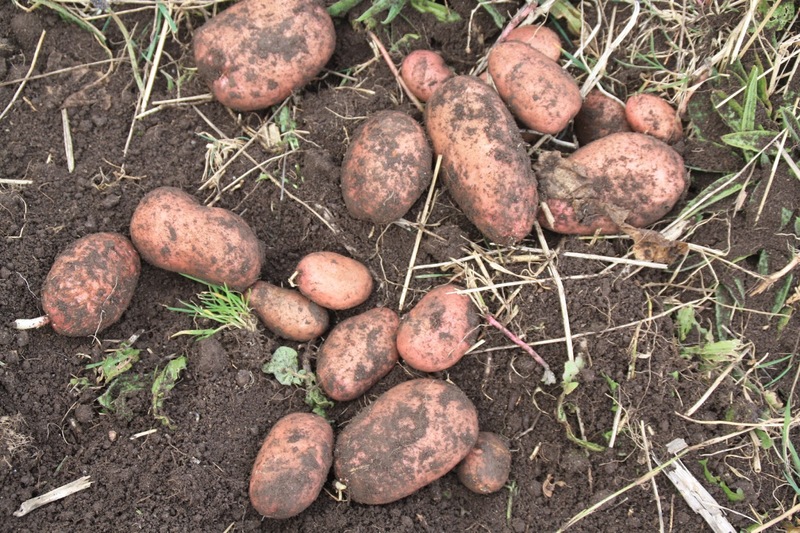 Sarpo Mira potatoes in the field awaiting collection. 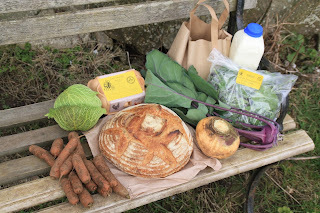 This is last Friday's small £6 veg box - carrots, savoy cabbage, purple kohl rabi, swede, potatoes, and mixed salad leaves - with optional extras of half a dozen free range eggs (£1.50), large organic sourdough loaf (£3.10), and a litre of organic full-cream milk (£1.20). Earlier today 27 pupils and 4 staff from St Just Primary School came to the farm for 2 hours, as part of their "Sowing and Growing" project. After a brief welcome and safety talk the group split into two, one group making seed-balls with Nikki in the propagation station, and the other group visiting the salad polytunnel and market garden with Hugh to learn about growing veg, salad, fruit and herbs. Halfway through the morning we swapped round so that no-one was left out. Hugh concentrated on the theories of sowing and growing, explaining what to grow where and when and why, plus the importance of bees, ladybirds, earthworms and compost. There was also a tasting session of salad leaves picked straight off the living plants, including winter purslane, rocket, mizuna, mibuna, tat soi, pak choi, buckshorn plantain, green in snow, and giant red mustard. 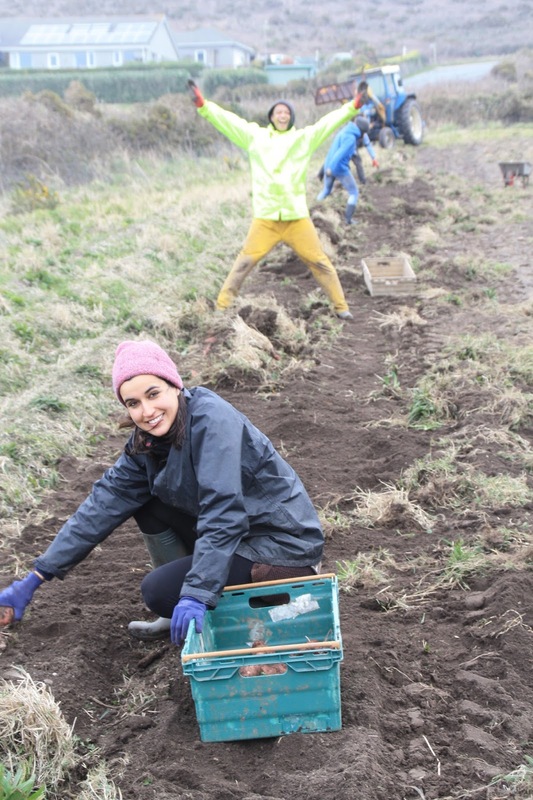 We finished the session stood in the cold wet windy drizzle of the market garden to underline the usefulness of polytunnels. Nikki led a far more fun activity, where everyone made seed-balls out of compost, soil and wildlfower seeds, then went and threw them onto the living roof of the cob round-house. We look forward to the flowers later in the year! Each pupil also took a seed-ball home with them to throw into their own garden. Many thanks to St Just Primary for visiting us today, for being so well-behaved whilst here, for eating our salad leaves with enthusiasm, and for sowing wildflowers on the cob building roof. Come back soon! 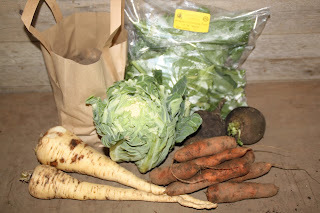 Small £6 veg box - valor potatoes, oriental greens, cauliflower, black radish, parsnips, carrots. 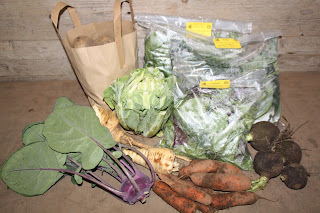 Standard £10 veg box - valor potatoes, oriental greens, cabalonero kale, mixed salad leaves, cauliflower, parsnips, kohl-rabi, carrots, black radish. We can deliver veg boxes to your door for only £1 extra in the following areas - St Just, Pendeen, Morvah, Treen (Gurnard's Head), Sennen, St Buryan, Crean, Paul, Newlyn, Mousehole, Lamorna, Porthcurno, Penzance, Madron, Heamoor, Newbridge, and anywhere in between.